Rico Torres is the chef of Mixtli in San Antonio, Texas. Along with fellow chef Diego Galicia, Torres devises thoughtful, concept-driven menus at their innovative twelve-seat Mexican restaurant in the land of Tex-Mex. One of my favorite things to do at home is to mash up avocado with yogurt and chili oil and add an egg, very much in the same way as the Turkish egg dish, çılbır. A lot of the ingredients in the dish reminded me of the ingredients we use here in south Texas: the Aleppo pepper is a lot like ancho and pasilla chilies, which have a little bit of fruitiness and isn't very hot. It's full of flavor but the heat backs it up at the end. Where I usually add lime juice and cilantro, this recipe calls for lemon juice and dill. I use a lot of Mexican ingredients in my own personal cooking, but we also work with a lot of yogurt at the restaurant and back at home. One of the things that falls under our culinary mission at the restaurant is looking for ways to make things healthier or lighter. In a lot of cases, recipes are really heavy—many foods are fried in lard when they can be roasted, and pepitas can add creaminess to a lot of dishes in place of heavy cream. Working more with yogurt was born out of that mentality because it has creaminess and acidity but is lighter than sour cream or crema. As soon as I see eggs, yogurt, and chili, I think, "That's my jam." It's my go-to, feel-good dish, especially when I'm trying to have a week without carbs and just eat foods high in protein and fat. Make like Torres and slot the Turkish eggs from Chef Paul Sletten of Abreo into your morning routine. For more from our partners at The American Egg Board, check out their full treasure trove of chef-created recipes here! 1. Start by grating garlic with a microplane into yogurt and season with salt. 2. Set mixture over simmering water until room temperature. Meanwhile for poaching eggs, heat two quarts of water to a low simmer (no bubbles). 3. In a saucepan, add butter and melt slowly until it has turned light brown. Then take it off heat. 4. Add Aleppo pepper, olive oil and season with salt to taste. 5. To poach eggs, carefully crack each egg into a shallow cup and cover with lemon juice to tighten. Carefully slide into simmering water and poach 3 to 4 minutes or until whites are set but yolk is runny. 6. To assemble, put an equal amount of yogurt on to 4 plates, then top with poached egg. 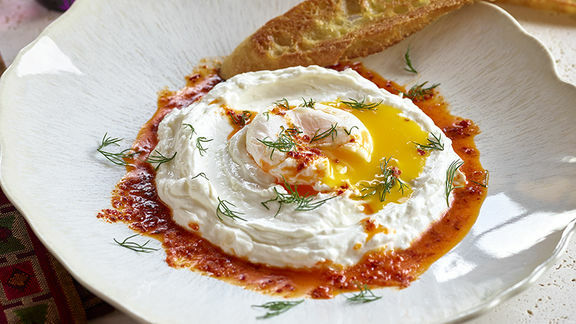 Add chili butter over and around eggs, garnish with fresh dill and toasted bread. A dish wrapped up in fond memories for a kid from the Midwest. Punchy ferments and herbaceous spice meet the humble scramble. A no-nonsense chef favorite from our partners. In case you forgot, an egg *is* a sauce. A summer squash crown for Eggland’s Best, the royalty of eggs. Ali Bouzari's here to answer the culinary questions that keep you up at night.